Notes on the world’s most disrespected wine. Riesling gets a bad rap—even at my house. My wife (sorry, honey) inevitably says about Riesling, “I don’t like sweet wines.” And that, indeed, is the rap on Riesling. But it’s downright unjust. 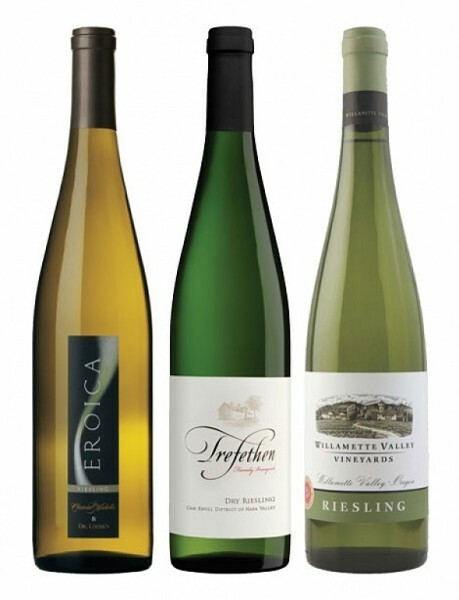 Yes, there are sweet styles of Riesling, but there are also bone-dry (not sweet) versions. And, to my mind, Riesling is just about the most versatile wine to drink with food that there is. So why are so few people drinking it? Well, Chardonnay, for starters. Chardonnay bullies Riesling around. It’s an all-too-easy wine to love. It’s not too dry, and it tends to be a bit on the sweet side. Moreover, lots of people embrace the vanilla and oak flavors that are typical of California Chardonnays. But in my opinion, all of those traits make Chardonnay a really good wine to sip before dinner, not during. Now, I’m a proponent, in the main, of drinking your favorite wine with meals and damn the rules. But the truth is that Chardonnay—especially the heavily oaked California variety—clashes horribly with most food. There is nothing subtle about those big, bombastic California wines, and they tend to overpower the taste buds with oak. Riesling, on the other hand, is an extremely agile wine for food; it plays well with everything from a simple roasted chicken or pasta with creamy sauce to spicy Asian foods and sushi. So, before you dismiss Riesling, spend a little time getting to know it. Riesling ranges from very dry to very sweet, and telling one from another is not always so easy. So here’s a tip: When choosing a Riesling to drink with a meal, if you’re looking at German Rieslings (where the best are made) look for the word trocken on the label. Trocken means “dry.” Also look for the word “dry” on labels of Riesling made in America. Dry Riesling is most suitable with food. Another reason to love Riesling is its price. A good bottle of Riesling from Germany, Alsace, Washington, Oregon or New York will cost you a fraction of what a fancy bottle of Chardonnay will set you back. Most are under $20 and there are plenty of good ones in the $10-$15 range. Some of the domestic Rieslings I’d recommend include Chateau Ste. Michelle Eroica ($21), Pacific Rim Dry Riesling ($9), Snake River Riesling ($9), Willamette Valley Vineyard Riesling ($10), Trefethen Dry Riesling ($21), Dr. Konstantin Frank Riesling ($18) and Chehalem Dry Riesling ($20). From Europe, some great Riesling choices include Zind-Humbrecht Riesling Turckheim ($33.50), Hugel Riesling ($20), Helfrich Riesling ($24), Gunderloch Jean-Baptiste Riesling Kabinett ($15.18) and Pfeffingen Riesling Trocken ($38.54).